I know a lot of you own long armers and some of you are even in business. Others of you may already have a relationship with a long armer. Still others like to do the quilting yourself either by hand or on your domestic sewing machine (DSM). With that said, one of my quilters who does not do pantographs or super complex quilting, but rather does quilt specific all-over quilting (rather than just stipple/meander) at a rate comparable to simple pantograph/stipple/meander is married to a fellow who just lost his job. Long story short, she may have to sell the long arm... [She does not have a website or blog.] & with her husband out of work, they need income. So if you need stuff done & want to give her a shot - let me know & I'll give you her e-mail. She is in Michigan, & I regularly mail stuff with no problems. The left side (4 book cases total). & the the trouble that my title alluded to... RB in my china hutch. I had just walked away to get another curio, turned around & look what I found! Now I know why I got a glass front cabinet! New cat charm quilt: Once upon a time ago, (Probably last December or January) I wanted to finish up several I Spy quilts.... I asked and several people sent me novelty charms for this endeavour. In return, I made star fling quilts for charity. To do those, I needed 3.5 inch squares of novelty prints. I trimmed my "scrap" novelty pile into 3.5 inch squares - that pile included cats. In addition, I already own a literal ton of cat fabrics so I cut into them too into 3.5 inch squares, ditto my other novelty fabrics. Once I had a huge pile (That trimming is mindless & I did it while watching TV not paying much attention to actual accumulation.) I started to sort them... I alsways start my sorting buy pulling out the cats. I thought if I like to see different cat fabrics in the same quilt, someone else will too. So I started to make charm packs. The next thing I knew, I had a big enough pile for the start of a charm quilt - while still sharing the furry goodness of a fabric purr. So there you have it, I am knee deep into a second cat charm quilt. & Theanks to a little help from my friends, I already have some new to me cat fabrics! YAY! In the begining there was a cat who loved to lay down on quilts. His name was R.B. (Rhythm & Blues) & he got caught napping on quilts all the time. His mom set this quilt aside - waiting to take a photo of the whole thing to share on her blog, but in the mean time she was doing a lot of other things around the house... She comes around to get the quilt for a photo op & look what she saw - a sleeping kitty - o.k. everyone say, "AWWWW." After waiting fo rthe kitty to wake from his slumber, the mom-blogger was able to spread the quilt onto her bed for a photo. WOW that is a rainbow log cabin. Aside: I saw this quilt in one of those "yearbooks" for quilts, along with the directions. )I used Eleanor Burns' method of Quilt in a Day to piece these blocks. A good deal of that "DAY" was during my lunch hour at work. Here is what I did, I cut the strips and sub cut the squares for the first seam. I took the pile of squares to work and pinned the correct number of red/orange, orange/yellow, etc. combinations together. I took them home, sewed them together and pressed them. I took the pairs back to work and pinned the next log to the pairs and repeated the home portion until I had my blocks pieced. A shot of the back - also in the not so distant past, I used a lot of muslin for backs - especially the extra wide stuff. Big stipple using rainbow thread - today I would have it quilted differently, but *repeat after me* "Done is better than perfect." A. I forgot my camera at home - so no photos & no stories about all of my WONDERFUL pictures. G. one last peek in my mind - the Liberated pigs that I can recall off the top of my head are: @ 3 Judy Martin inspired patterns, 2 dogwood patterns, 2 pink & black projects, 2 pink and brown projects - 1 primary 1 secondary - yes I have a plan for my scraps!, 3 taupe projects, 1 primary, 1 secondary, 1 teritary - yes I have a plan for my scraps & and plan for that scraps that the second pattern will create!, something in orange/pink/raspberry - Irish Chain variation or 1/2 log cabin variation - or both..., blue & yellow cats - too many fabrics for 1 quilt...., something in plaid/striped homespun, CW repro. baskets, sushi quilt, ETC! REMINDER These are all uncut bundles of fabric with books and or patterns (or just ideas). I have been collecting "blog fodder." I will share some of that now. The winners of the "You think you've bought a lot of fabric" contest. These are retail customers. The names have been omitted to protect the innocent. I used to love that shop - my bill never came close to any of these numbers (not even in aggregate.) See, it could be worse. Speaking of fabric stash, I got the "in the closet" shelves up yesterday - now to get the fabric in there! Does anyone else save tidbits from around the net so that they can share them later? I am very happy with this composition. Most recently is the "What shade of green are you?" quiz. At first I barely glanced at it thinking with was what color instead of shades of green... The I saw so many greens.... As someone who made a Project Spectrum Green quilt, I can attest to the variety of greens out there! So I took the quiz & I am a different color that those that I have seen blogged! I am Mint Green. However, when I do those quizzes they invariably mess with my computer - so much so that this is my second time to write this post.... (Mint sounded pretty o.k. for me, but I can not share the mintyness here...) Back to no quizzes on my blog for me. That's my girl! Since we are in the middle of a move, I am watching this movie on my laptop. This same laptop had a commercial for this store & there mascot, who would walk across the banner and leave the screen periodically - much to the chagrin of Rhapsody! She would try to catch that mascot and when it left the screen, she would look behind the laptop trying to find it! So she is my computer junkie! - She will watch a little TV too, but she loves the laptop. BTW This photo was take right before she decided to sit on the keyboard completely blocking my view of the screen. We are about to hire a hand man.... The other furniture is bound to be "harder." First, thanks for all of the lovely comments! Second, after a second glance, the dining room is a different color warmer yellow while the living room is a cooler taupe. Third - ugh where did we get all of this stuff & where are we going to put it now that we got it here? We hired contractor "A" (Two guys and a truck), the truck broke down, so he hired a sub contractor (two guys and a trailer). So we are looking a two trips instead of one (The job is charged hourly & the 30-45 minute trip each way costs...) o.k., not happy with that but o.k. anyway. The movers were supposed to arrive at the apartment at 10 - they got there cloer to 11! We finally got that back into the living room & it is waiting to be unassembled to that we can reassemble it in the "stewdio." Michael was talking to the guy about paying... (We agreed with the original guy to use our check card. This guy wanted cash.) They left without getting paid, but did not ask for any more money than we agreed upon up front - which is a good thing considering my walls, the wait, & the amount of work that we did that we hired them to do! I hope your weekends were at least more restful! A view from my home. This is my "stewdio" the master bedroom is painted the same, but it has a walk in closet while this one has shelves. (Can you see my stash on those shelves?) Have I mentioned that I love the purple paint? And the main bathroom. (I won't share the master bathroom - just visualize circa 1970's 3/4 bath...) This one had a tub, but it now has a shower with a "seat" and just out of view are side jets for a shower massage. I did not get around to taking photos of the condo during/after the final walk through this morning - I "NEEDED" to get to the office. So I am not going to yammer on about that! I seem to keep packing quilty stuff. I NEVER would have guessed the amount of stuff that I already own! So I am going to try to ruthlessly weed my stash & stuff. New quilt.... I am also thinking about starting a new quilt - one that will be 100% pieced in my new "stewdio." The TAUPES are screaming my name. 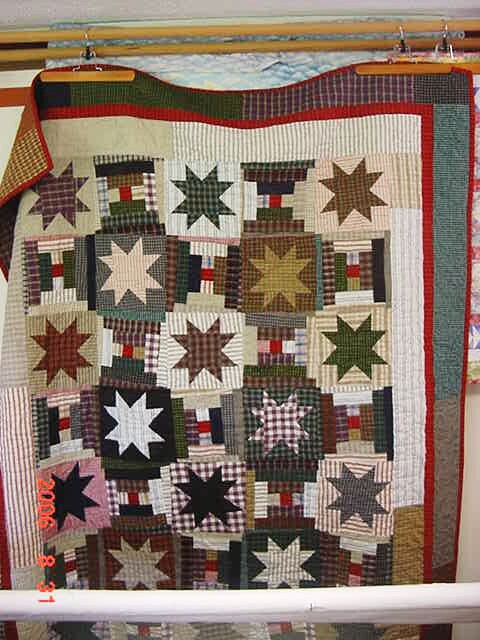 & There is a gift quilt that I want (different from need) to make for my dad, the train guy. To say my dad is a train FANATIC is to understate it a bit. So I already know that I am going to do railroad crossing as the pattern. 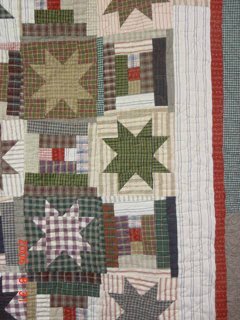 Like this one: "Railroad Crossing" quilt. (Not like 80% of the others that I saw while trying to find something for you to look at...) I might add a sliouhette of a train on the top border.... (I have novelty trains to go where the photo shows blue squares, & My background will be scrappy - to the extent that some of them will be 4 patches & 9 patches in addition to the 1 big square on purpose.... Yeah I am a rebel! I am not sewing! (at all.) but I have a "hand" project out of the packing harms way - just in case. On the home front - the "rent back" period ends tomorrow... So we actually take possesion on Thursday. Bathroom demolition takes place on Saturday along with moving (we hired movers - so I am packing like mad) and two different furniture deliveries. Hopefully some "before" photos on Friday.... & During photos on Monday! Michael & I are HOMEOWNERS! We signed the papers this morning. :o) Now for the fun filled packing time, moving time, bathroom remodelling time, pining for new kitchen appliances time, waiting for furniture to arrive time, & cats adjusting to the new area time! The second bit - Many thanks got out to "The Quilter!" In a stash reduction move on her part, I got 3 NEW to me cat fabrics. (I own about 600 different cat prints...) Two are different color ways to those who already live with me & the other was BRAND NEW to me while already having lived a long-ish life with Paula. I am not sure how big the second cat charm quilt will be... I guess it will tell me when it is "done." My grandparents are finally discussing moving into a Senior Apartment - so the "we have to get rid of stuff!" movement has begun! I got it yesterday! No photos yet, it is in a box along with some crocheted items that my paternal great grandmother on my fathers fathers side made. The short version - I got some handmade items that two of my great grandmothers made. I also got some woodworking items that my grand father made & a framed embroidery piece that my mother made in the early 1970's. I hope to get some antique kitchen items when my grandmother actually moves - like an old glass rolling pin. (Anyone have any "shout at you green" homespun plaid? What about a "bossy high contrast" big plaid - like the purple one in this quilt?) I think Cher (Marathon Quilter) or Patti (Quilting is my Passion) went to a local show & shared pictures - one of which was a "Chinese Coins" variation with applique (In my mind at least, I have been known to embellish other memories.)... Ring a bell? It was Patti - (I have one of those memories - can't remember what I need to remember, but other things get stuck like a steel trap!) You can see it - if you go back to April 6th on her blog - click the "Patti" link above. A little closer view... I was SOOOOO happy when I found that red. It is not homespun or shirting like the rest of the top or brushed cotton like the backing, but it is PERFECT - if I do say so myself. I found it at the Mid-Atlantic Quilt Festival this year. So why is it wonky - you may be asking... Well, I needed to "square up" the blocks. I decided instead of fussing to get it right on 90 degrees, that it would be easier and more fun to skew it. Some roll more than others... It probably would have made more sense if my logs were also skewed, but.... It is done! and "Done is better than perfect" EVERYDAY in my life. I just started a flickr. I have uploaded several Chihuly photos complete with comments. I can not figure out if I have my own flickr or not, bu everything is tagged Chihuly. (I also uploaded them onto my webshots - address below in previous post.) Enjoy! O.K. I took this quote verbatim from Debra at Debra's Design Studio. I could not have said it any better...To the best of my (Debra's and mine) knowledge (which is small), there is currently a thin line between blogger and blogger beta users that will not allow beta members to comment on blogger blogs if the only comments allowed are for blogger accounts. If you only allow blogger accounts for comments, I cannot comment on your blog. If you allow others or anonymous comments, I can comment on your blog. I can post as other or anonymous with a blogger beta account. (Had I known. . .). Once you have gone to the blogger beta, you are no longer a regular blogger. You cannot go back or go between the two systems at random. You choose beta, you stay beta. Or, you design a new blog. I am sure in the close future, Google will figure out how to make the two systems compatible but until they do, we have to go behind their backs for comments.My suggestion is this --- turn on your Anyone feature in your preferences (Who can comment?). Then, I can comment. How do you make a picture smaller? If it is 2221KB now, how do I make it 1500KB? I am trying to start a wordpress blog.... I may try typepad too - wordpress is not "my thing" so far. I went to a quilt shop on Saturday - the 1st - so it was o.k., I purchased fabrics for a landscape quilt. & a few for an Irish Chain variation. Michael & I went to the Chihuly exhibit today and it was wonderful. I took over 200 photos, so once I get back to Washington, I hope to upload them and to share a few. I will also be moving my blog to a new venue - I am just so PEEVED with blogger beta. I also have a new quilt to share (The log cabin with stars that I shared while it was in progress is quilted.) but that too will have to wait.